Thank you Freeform Games for creating such a fantastic game – we thoroughly enjoyed it and are eager for more!" "Brilliant – thanks so much! We played Dazzled to Death last weekend, and it was a real success – none of us had ever played one before, but people got really into character, and everyone enjoyed it hugely." "Just a quick note to say that we had a wonderful time playing our murder mystery party! All our friends fully immersed themselves in the atmosphere, the character and the costumes! A fantastic and memorable night was had by all, we are so looking forward to doing Dazzled to Death and will report back with the results...! I would highly recommend anyone considering buying a Murder Mystery to do it! They are so much fun, everyone joins in regardless of how shy you think they are and you can unearth some very interesting character traits!" "I LOVED it! I had Dazzled to Death for my 15th birthday party, and though we were nonchalant at the beginning we had a ball! It was such a successful night full of betrayal, murder and suspense! My friends are all begging me to host one next year!!!" "We just played the game Dazzled to Death and what a blast! Everyone came fully costumed and fully prepared for an evening of murder and intrigue. With great food, good music, fake candles and an inflatable moose head, my apartment was totally transformed into a hunting lodge! Thanks guys! " "We played Dazzled to Death recently and had a great time. Everyone was really involved and enjoyed themselves (with varying levels of success in the actual game). Everyone was dressed up and there were even some American accents being maintained throughout the night! A wonderful product, and I will certainly be buying more in the near future." "Dazzled to Death was the first time I've run a murder mystery game, I followed your instructions closely and everything went really smoothly, so I wouldn't change anything. There's no need for the host to panic when they read all the info and character profiles. It feels like there's too much info to take in and remember on the night, but in reality the game runs itself once all the guests know their characters, it's brilliant, quite magical! It was nice to have an excuse to get the girls to glam up with diamonds etc, and get the boys to dress up too. It was really fun to assign characters, they seemed to fit my group of friends really well. It was very funny to choose the fathers and sons! We also decorated our house and found we could think of decorations to suit the theme. I would really recommend making the props ie the diamonds and paintings, it really added to the fun. I was really amazed how involved in the game my friends became. I was a little sceptical at first because I thought it was going to be too complicated, but the evening ran really smoothly and it was very satisfying to see all the plot lines unfold. It bought out lots of mischievousness in my friends! Not everyone guessed the murderer, so it was a great reveal at the end too. Thanks for a great evening, for the level of fun we had the game was a real bargain!" "Just to let you know that we had the Dazzled to Death party on Saturday last and it went exceptionally well. Our guests dressed for the occasion and were at their devious best to discover who the murderer was and who was having it away with whom. Their pleasure is evidenced by the e-mail and sms chatter talking (mainly in character) about how things went. The notes, props and character notes were ideal and worked brilliantly. Even a couple of (very) shy guests warmed up and got into the spirit of things. When time came to wrap up, people were amazed at the time (10:30pm) and wondered where the evening went. Our logistics were that I was the waiter and essentially served the meal and drinks through the evening, adjudicating as we went along. We tried to call a halt for the meal, but that break lasted about 10 minutes and then they were into character again. The players didn't want to stop for the meal such was their involvement – lucky we planned a buffet-type meal that was easy to walk around and serve. Anyway, once again, thanks very much and we look forward to planning another one in the not-too-distant future." "I just played Dazzled to Death last night, and now I'm on here looking for more. I've played a number of other murder mystery evenings and always got tired with the scripted format – I just wanted to be let loose to find things out for myself! Well, this certainly delivered. There was intrigue, attempted poisonings, constant uncertainty of who was telling the truth, and I loved it. We all got so into our roles that we spent a good hour discussing the events of the evening after we'd finished, and are still realising more as we discuss it today. All I have to do now is work out when we can play our next game!" "Dazzled to Death was brilliant! I had a variety of different friends over, and they all enjoyed getting into character and attempting to solve the mystery! " 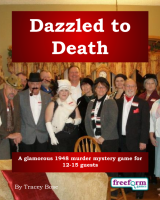 Dazzled to Death is a dinner party murder mystery game for 12 to 15 guests and a host – download the free introductory pdf file. In Dazzled to Death, the stage is set for an innocent family gathering, with a few friends and strangers added to make the party go with a swing. However, not everyone is as they seem -- some have dark secrets they need to keep hidden... and someone is the killer. You will be in the middle of the action and it will be up to you to wheel and deal with the other guests. Can you achieve your goals, keep your secrets hidden and survive Dazzled to Death? It's up to you. Who has been wearing a mask to sneak around? Who will inherit the Dazzling Diamonds? Would the infamous cat-burglar 'the Puma' dare to strike here? Are the Evington-Browne family in danger of losing their money, their reputation in society and their sanity? Can anyone keep control of Tracy's pet monkey? ... and, of course, who killed the valet? Find out in Dazzled to Death! Dazzled to Death lasts for about four hours and is suited to an evening. It is often played over a meal – a finger buffet if possible to allow guests to circulate and talk in private. The free introductory pdf file contains an introduction to the game, a cast list of all the characters, and a copy of the Boston Times – plus details of how to buy the game. Important note: Dazzled to Death is an alternative version of one of our other games, The Night before Christmas. The characters and the plots are the same, so if your guests have previously played The Night before Christmas, they'll know the secrets of Dazzled to Death too! The difference is that The Night before Christmas is written specifically for a Christmas setting, while Dazzled to Death is suitable for any time of year. Dazzled to Death is unlike many murder mystery games. Although the game starts with a death, most of the characters have more important things to do than to investigate it. And the killing may not be over – it is unlikely that everyone will survive the remainder of the evening! Dazzled to Death is played just like a murder mystery game. You may be trying to solve the murder, but primarily you are (initially at least) concentrating on your own goals and objectives. Unlike most boxed murder mystery games, Dazzled to Death lets you decide how to achieve your goals and thwart your enemies. "Thank you so much for letting me download the new files and the extra characters. The Dazzled to Death party was a huge success, everyone enjoyed it and the two extra characters fitted in seamlessly! People are already talking about which game we should buy to play next – except this time someone else can host, so that I can try my hand at detective!" On the evening of the game the guests are met by the organizer, the Waiter, and welcomed to the party. They then receive their detailed backgrounds - including dark secrets, goals and items. The fun then begins as players form alliances, blackmail each other, steal items and maybe even resort to murder! Depending on what the players choose to do, there are several different possible endings, but finally everyone finds out how they did, and what secrets everyone else was concealing. Dazzled to Death costs £20.00 (GB pounds) or US $29.99. You can buy it in either currency, from anywhere in the world, as you prefer. The price will be converted back into your own currency for you, at today's exchange rate. We offer a Cast Iron Guarantee on all our murder mystery games. If you're not completely satisfied with Dazzled to Death then please let us know within 30 days and we will refund you. See our full terms and conditions here.